During the holiday season our nutrition and kitchen teams get creative to prepare and deliver familiar, seasonal dishes that provide comfort to our critically ill clients while meeting dietary restrictions. 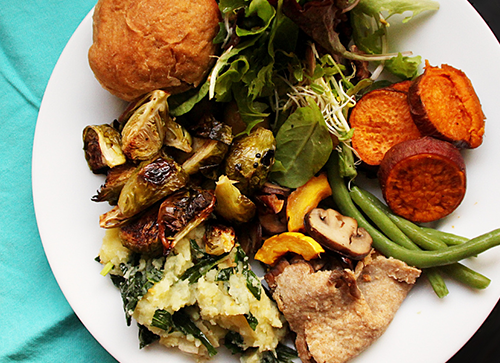 This vegetarian recipe will be found in many of our clients’ meal bags this Thanksgiving. Peel and cube sweet potato. Bring a pot of water to a boil, add sweet potato, and cook until tender (10-15 minutes). Drain and let cool. Place cooked sweet potato in a bowl and mash, using a splash of milk, until smooth. Bring another pot of water to a boil with a pinch of salt and cook pasta as instructed for 6-8 minutes, until al dente. Drain and set aside. In a large casserole dish, add pasta, spinach, and cheese sauce. Mix until spinach is slightly wilted and pasta is well coated with cheese sauce. Sprinkle remaining cheese on top. Bake for 25-35 minutes until cheese on top is bubbling and browning.